We got to do a poster for Jerry Garcia! For a big 75th birthday concert bash they had at Red Rocks on August 4, earlier this summer. Word is the 600 posters they had at the concert were sold out in an hour. That’s fast! Thanks to all the Jerry fans and folks who reached out after the show about extras. We’ve got a stash of 50 on hand, from our “Artist Proof” stash. All of this, sanctioned by Jerry’s management team. Thank you for the honor to work for an American icon. Thank you, Jerry Garcia. 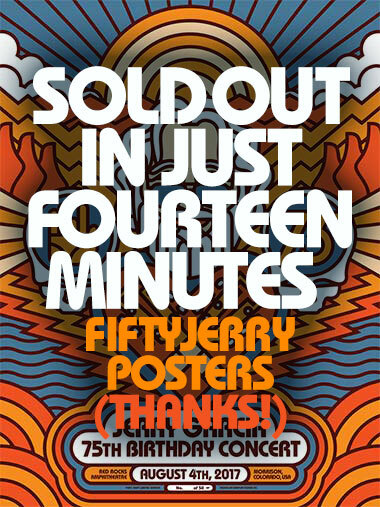 Today, we’re offering a COSMICALLY LIMITED EDITION of fifty of these Jerry posters…right here, right now. GO! AND HEY, limit of one poster per order! Be cool, be cool. 02. Five colors! Inspired by Red Rocks setting suns. 06. Works really good on the wall at Terrapin Station, deep inside Franklin’s Tower, in a rented room at the Mars Hotel, wherever you might be in Weather Room Suite, in a back room of Brokedown Palace, and of course, tacked up on a wall in the Attics of My Life. 07. Dedicated to Jerry Garcia. 09. Insanely limited edition of 50 from the “Artist Proof” stash! GOING FAST.